1. The central and more extensive part of the Jordan valley, referred to in Gen. xiii. 10, 12; xix. 17, 25, 28, 29; Deut. xxxiv. 3; II Sam. xviii. 23; I Kings vii. 46; II Chron. iv. 17; Ezek. xlvii. 8. At a later period Kikkar may have included the neighborhood of Jerusalem (Neh. iii. 22, xii. 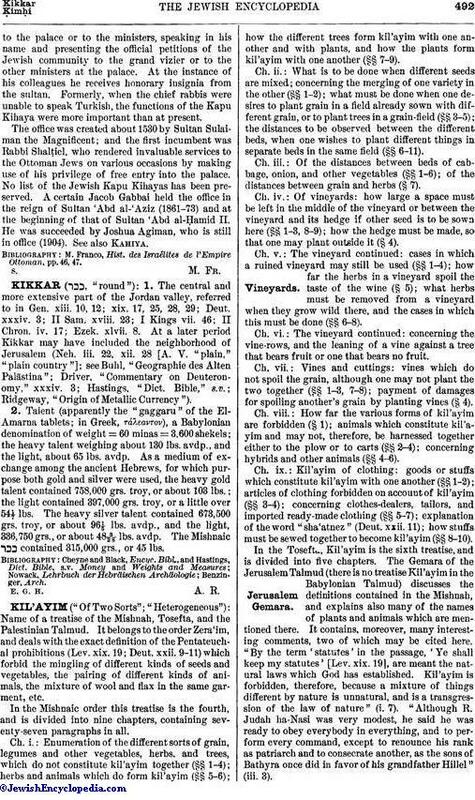 28 [A. V. "plain," "plain country"]; see Buhl, "Geographie des Alten Palästina"; Driver, "Commentary on Deuteronomy," xxxiv. 3; Hastings, "Dict. Bible," s.v. ; Ridgeway, "Origin of Metallic Currency"). 2. Talent (apparently the "gaggaru" of the El-Amarna tablets; in Greek, τάλεαντον), a Babylonian denomination of weight = 60 minas = 3,600 shekels; the heavy talent weighing about 130 lbs. avdp., and the light, about 65 lbs. avdp. As a medium of exchange among the ancient Hebrews, for which purpose both gold and silver were used, the heavy gold talent contained 758,000 grs. troy, or about 103 lbs. ; the light contained 397,000 grs. troy, or a little over 54 1/7 lbs. The heavy silver talent contained 673,500 grs. troy, or about 96⅕ lbs. avdp., and the light, 336,750 grs., or about 48 3/28; lbs. avdp. The Mishnaic contained 315,000 grs., or 45 lbs.